Starring : Daniel Day-Lewis, Lesley Manville, Vicky Krieps, Gina McKee. 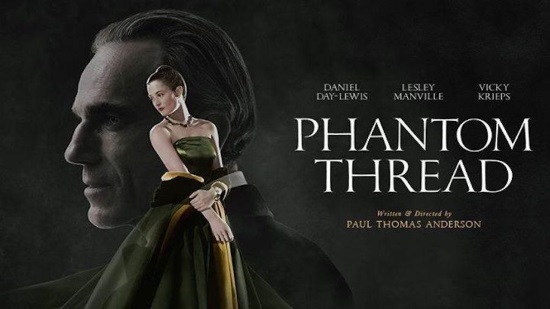 Phantom Thread (15) has much to commend it. Mark Kermode includes it in his Top Ten films of 2018. Not only is it an Oscar-winning film, it also had another 47 award wins & 97 nominations. It receives an impressive 91% on the Rotten Tomatoes website and it was chosen by its star, Daniel Day-Lewis, to be the film to feature his last-ever screen performance. Set in the glamourous world of 1950s post-war London, renowned dressmaker Reynolds Woodcock (Daniel Day-Lewis) is a man whose charisma and genius are matched by his obsessive, controlling personality. Together with his sister, a meticulous and Oscar nominated performance from Lesley Manville, they are at the centre of British fashion; dressing royalty, movie stars, heiresses, socialites, debutantes and Dames, all with the distinct style of The House of Woodcock. Women come and go through Woodcock’s life, providing the confirmed bachelor with inspiration and companionship, until he comes across a young, strong-willed woman, Alma (Vicky Krieps), who soon becomes a fixture in his life, as his muse and lover. A once controlled man with plans, he suddenly finds his carefully tailored life disrupted by love. Phantom Thread is a stylish, elegant movie. Its Director, Paul Thomas Anderson (Boogie Nights, There Will be Blood, Punch Drunk Love) has created a visually stunning film with a sublimely eerie and immaculately constructed web into which its audience will be drawn. The central performances are masterclasses in acting and the film's impact will stay with the viewer long after the closing credits have rolled.